A gift of this candy stripe amaryllis plant inspired this painting. 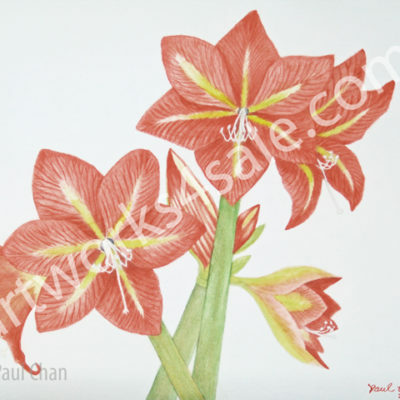 Our fine art giclee prints are made to exacting standards using only quality materials. Each print has a 2″ border for handling and matting. All of our art prints are custom ordered for our customers. This usually requires approximately two weeks from the time the order is placed and paid for. We use Hahnemühle 100% cotton rag acid free paper, 310 gr/m2. This paper provides long-term image stability, masterful color matching, vivid colors, and rich blacks with excellent durability and outstanding fade-resistance for more than 100 years. All of our prints are personally inspected by the Artist before shipping, rolled in a rigid tube container. We want you to be able to enjoy these prints for many, many years. We recommend that you arrange for matting and framing upon receipt. The images on our website are lower resolution images protected by visible and invisible watermarks. 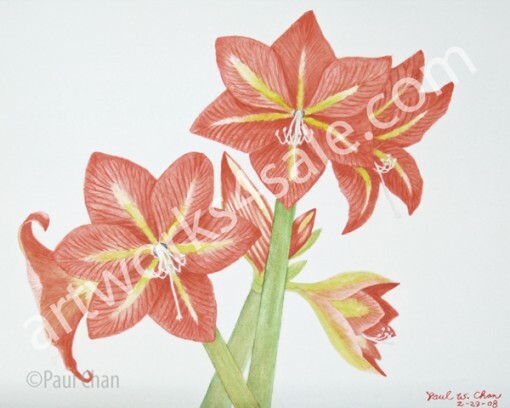 The artwork prints we ship to you are a higher resolution and do not have these watermarks. We want you to enjoy having these prints for giving and for framing.